Sub: Govt. of A.P - School Education - Dance teaching through "Kuchipudi Sikshna Pathakam" in Govt. Schools - Appointed 172 Kuchipudi Dance Teachers - Allotment of Govt. High Schools to the dance teachers in 9 Districts - Reg. The District Educational Officers of Guntur, Kadapa, Krishna, Kumool, Nellore, Srikakulam, Vizianagaram, Visakhapatnam, West Godavari districts are informed that, as read in reference 1, the Govt. of A.P has initiated a scheme called “Kuchipudi Sikshna Pathakam” to teach Kuchipudi in Govt. High Schools in A.P. 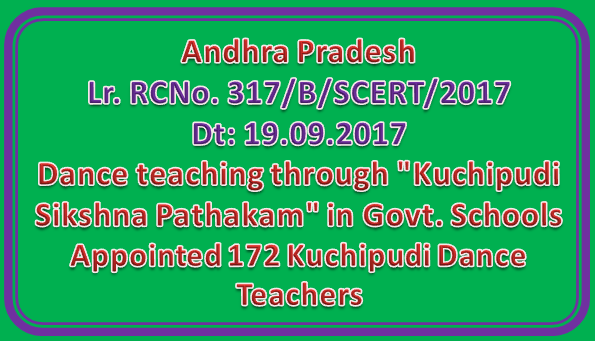 For this purpose the Andhra Pradesh Creativity & Culture Commission, Kuchipudi Natyaramam has selected 172 Kuchipudi teachers to teach dance in the above mentioned districts. The list of teachers and the letter from the Dept. of Language and Culture is annexed herewith. In the reference 2 cited, The Director, Department of language and culture, Vijayawada, A.P has requested for the allotment of schools to the selected Kuchipudi dance teachers. Details of the programme are as follows. 1. The dance teachers will teach Kuchipudi dance to students from class 6 onwards. 2. They have to conduct 10 instructional hours in 5 schools together @ 2 hrs on a single day! 1 hr on two separate days in each school per week. 3. Each teacher has to be allotted 5 govt. High Schools within 20 Kms distance from their residential addresses. 4. Rs 12,000/- per month towards honorarium to the dance teachers will be paid by the Department of Language and Culture as read in reference 2. 1. The programme should be conducted in High Schools of ZP/Govt./APMSIKGBV managements. 2. Ensure that the schools should have a minimum strength of 150 and above. 3. Please note that Dance programmes in Govt. Schools in Chittoor and Visakhapatnam are being conducted by two NGOs namely Syllogist Foundations in Chittor and TIPA - Artizen in Visakhapatnam. Hence you are requested to exclude those schools from this Kuchipudi dance programme to avoid duplication. 4. Volunteering students, both Boys and Girls from classes 6 to 9 are eligible to learn Kuchipudi. Please encourage the students to make use of this opportunity. 5. See that 10 students from each class (5 boys and 5 girls) should be selected from class 6 to 9, so that the dance class size would be 40 all together. 6. Consider the interest of the students, opinions of the class teachers, P.E.T while selecting the students. So selections shall be made accordingly. 7. The dance classes may be held during the Physical Literacy hour, at the end of the Day. An additional one hour per session may be provided by extending the school hours for these students. Head Masters should ensure proper security and safety of the students who will be staying back for the dance classes. 8. Head Masters shall be instructed to facilitate conduct of Kuchipudi Dance Classes in their respective schools and provide a spacious room/hall for the conduct of the dance classes to the Dance Teachers. 9. If required a joint meeting may be held for all the Dancers and the Head Masters/Nodal Teachers for setting expectations and to provide clarity on roles and responsibilities. 10.The children learning Kuchipudi dance may be encouraged to perform the School Programs, participate in Kala Utsav Competitions and other events in the community. After identifying the eligible schools with sufficient enrolment and space for conduct of the dance class, the DEOs concerned are requested to call the selected Kuchipudi dance teachers, and counseling shall be conducted for the allotment of 5 schools to each teacher especially where there are more no. of dance teachers from the same town/area. The Deputy Educational Officers shall be entrusted the task of counseling. Allotment orders shall be given accordingly. It is further requested to complete the entire exercise within a week and ensure that the Kuchipudi dance classes commence from the 2 term beginning onwards. A copy of the list of allotted schools should be communicated to SCERT and CSE offices by 30.09.2017. It is further requested for the close monitoring of the programme. Monthly feedback report from the Head Masters concerned should be called for. The monitoring shall include quality of dance teaching, interest of the students towards dance learning, impact on studies and activeness of students, parents’ response, suggestions for the improvements in the programme etc. The consolidated report from your districts should be communicated for each term, to the commissioner of School Education, A P and Director SCERT for further course of action.